PHILLIMON HANNECK, one of the finest middle-distance runners to emerge from Zimbabwe in the post-independence era, has now turned his hand to coaching athletics in the United States but still retains some bitter memories of his frosty relations with the then Amateur Athletics Association of Zimbabwe.Hanneck, who left Zimbabwe in January 1990, is now based at Jacksonville in Florida, where he is coaching a group of high school girls from 13 to 18 age-groups. “I am coaching 15 girls from ages 13 to 18 who are at high school. I coach part-time only,” Hanneck said yesterday from his base in Florida. The former Allan Wilson High School pupil, who has been living in the United States for the past 24 years, revealed that he now has a full-time job at a bank in Florida. “I like to live a quiet life . . . I went through a lot when I was in Zimbabwe, but I have a stable life now. I have one daughter, who is 12-years-old, and a long-time girlfriend, who is a physician. I work for a bank in the risk and fraud department analysing accounts. “I coach track and cross-country athletes in Florida. Remember I was banned from going to the 1996 Olympic Games by the then Amateur Athletics Association of Zimbabwe (now National Athletics Association of Zimbabwe) for no apparent reason. They indicated then that I refused to come to Zimbabwe to compete in the 1995 All-Africa Games. “They didn’t realise that I was in America and I couldn’t walk across the Atlantic Ocean to Zimbabwe. They didn’t buy me an air ticket for me to come there for the 1995 All-Africa Games. “Other athletes were given air tickets that enabled them to fly from their respective bases to compete in those Games. 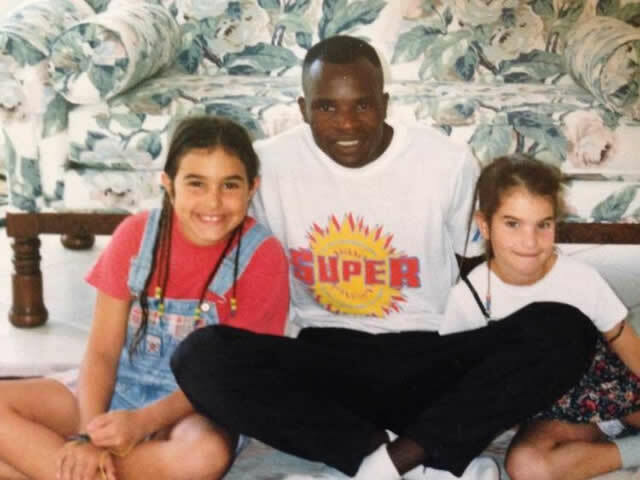 I had a great chance to win a medal for Zimbabwe at the 1996 Olympic Games,” said Hanneck, who studied at the University of Texas in Austin, United States. The 43-year-old coach said he still vividly remembers some of Zimbabwe’s top athletics coaches such as Mike Lockhead, Gift Chigwere and Chris English, “who all made it possible for me to turn into a world-class athlete”. Hanneck said he still keeps track of sporting events in Zimbabwe and has heard of the exploits of 16-year-old female middle-distance runner Enlitha Ncube and he indicated that he would like to take under his wings in the United States. “I would like to get hold of this young girl named Enlitha Ncube. She was here in the United States for the World Junior Championships in July this year. I would like her to come to the United States to finish her high school here. I will pay for all her expenses. I can see her doing well in athletics if she gets proper training, good food and nice facilities to use. I have sent e-mails and Facebook messages to her coach, but without success. “I really want that young girl to come and join the girls that I train here in Florida and hopefully she can get a scholarship in athletics. It’s not going to be cheap, but I think I can manage to help any upcoming athletes in Zimbabwe. I want to bring back the glory days of the 1990s,” Hanneck said. Ncube hails from rural Silobela and is tipped to be the next big thing for athletics in Zimbabwe. She represented Zimbabwe at the IAAF World Junior Championships at Eugene in Oregon, United States, in July where she ran in the girls’ 1 500m event but failed to land a medal. Ncube will be part of a 10-member Zimbabwe team that is going to compete at this year’s Youth Olympic Games in Nanjing, China, where she will race in the 3 000m event. The team is set to leave for China on Monday. Ncube is currently ranked as the fourth-best junior runner in Africa in the 3 000m event and she is under the guidance of coach Briad Nhubu.